The nomadic custom of herding sheep and goats on horseback is said to have spread on the steppes from around 1000 B.C. The number of cattle that can be managed on foot is incomparable to that which can be managed by horseback herding. Allowing simultaneous herding of hundreds of animals, the spread of horseback nomadism changed life on the steppes dramatically. With these changes in lifestyle, certain nomadic peoples living on the western outskirts of the steppe around the northern shores of the Black Sea began appearing in written records. Among these peoples, the Cimmerians or Scythians in the west, along with the Xiongnu (匈奴) or Wusun (��O) people of the East in particular start making their appearance felt. There are specific descriptions about these nomadic peoples in both Western and Eastern historical records, such as The Histories of Herodotus or the Accounts of the Xiongnu (Xiongnu-zhuan 匈奴��) in Bangu’s (班固) Hanshu (�h��), which point out similarities in their culture and customs. 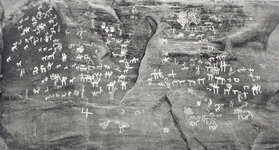 In addition,petrographs(4) discovered on the steppe show engraved images of horseback herding, from which we can learn something of their customs at the time. Below, we will consider several aspects of this relationship between horses and people along the Silk Road. Humans have long used domesticated animals for meat and milk. They have also used them as well as assets for trade. 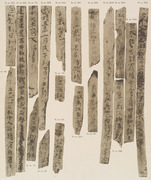 One may observe, such an instance, in a wooden slip(5) that M. Aurel Steinexcavated at Niya in N.xv.109 site, in the southern part of the Taklamakan Desert. The document inscribed in ink(6), dating from more than 1000 years ago, in records how horses were used as collateral for loans[d]. In addition, awooden slips found at the N.xv.324 site(7), documents the appearance of a horse with white spots[e]. Such records serve as evidence to show the way in which horses were handled as assets at the time in this area.